-- 0.75 oz 1.5 oz. 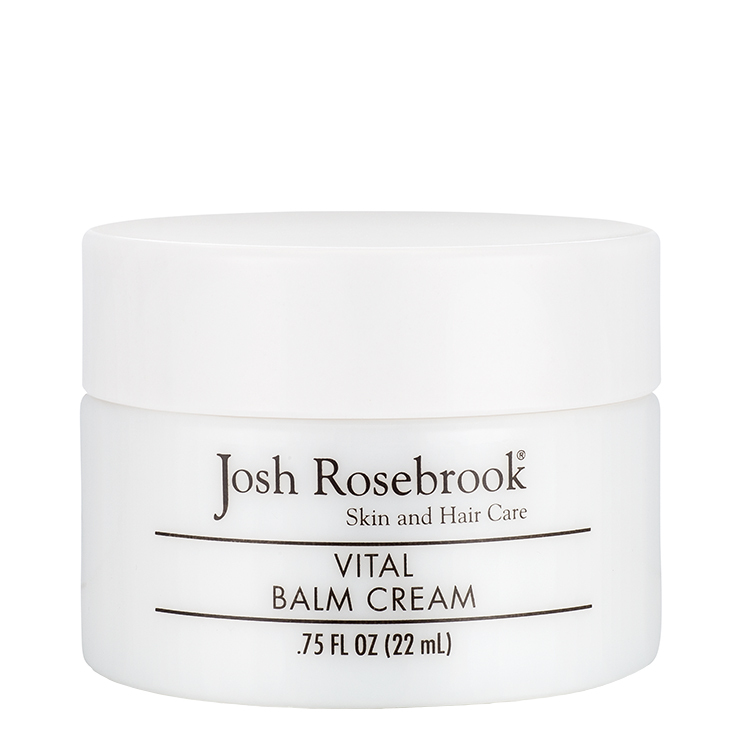 Vital Balm Cream uses powerful ingredients to offer the deep moisture feel of a balm, with the non-greasy and luxury feel of a cream. This multi-benefit moisturizer gives a hydrated and restorative feel to skin. Aloe Vera, organic ingredients and rich plant oils make skin feel supported and regenerated. Indian Senna Seed, also known as ’botanical hyaluronic acid,’ boosts the feel of skin repair. The result is a plumped, soft, and radiant appearance. Mist face with Hydrating Accelerator. Next apply Active Infusion Serum, then apply a small amount of this Josh Rosebrook natural skin balm evenly over entire face. I have been using facial oils exclusively for a while now, but it just wasn't enough for cold, dry winters in California. I've been using the Vital Balm Cream since October 2018, and it's made a world of difference. No more flaky skin! I do layer it over or under another product (oil or serum) for extra hydration. I think this balm cream could work alone as a light moisturizer in the summer. The 0.75 oz size has lasted about four months with nightly use. Also, the jar appears to be opaque glass, not plastic; it's quite solid too. I think it smells quite lovely! This is one of my favorite products. I love the texture (mousse like) and whilst it’s hydrating, it’s not greasy. Perfect for the mid atlantic winter! Didn't think I would like this. It contains blue tansy, and I dislike the smell of that intensely. Also, the idea of a balm did not appeal to me--I was afraid it would be waxy. But the texture of this is light, almost mousse-like, and then it went on without feeling too waxy or heavy at all. My skin felt very soft in the morning. The scent was not at all unpleasant, even though blue tansy is often overwhelming. Not sure I will repurchase this, but I will definitely enjoy using this!